I've spent many hours farting around, downloading various and useless apps, signing up for various photo managing accounts, and trying them out and having very little success uploading photos from my iPad to blogger. BUT, I think I finally figured out a workable solution! Yay me! I'm sure there are better ways, but for those interested, I will give you a brief step by step. Anyways, back to the meat of the post! This is my card, ta-da. I am really loving using Mojo Monday sketches! I used the computer for the main sentiment and regular stamps for the 'love' and 'forever'. I used my silhouette to make the circle and scalloped circle. I used Harper's Boutique by The Paper Studio for the dp, a Prima flower and Wild Orchid Craft leaves. This was made for my husband and the sentiment is so perfect. He has helped me become such a better person with my self-esteem and confidence. He is the positive to my negative, the social to my anti- social. He really is my better half in so many ways! He really liked this card and I hope you all do, too! Have a fabulous weekend! This is gorgeous. 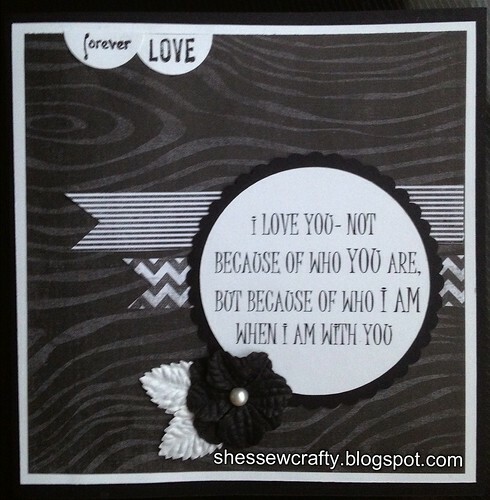 Love the black and white and the sentiment is just lovely. I think this is a fabulous masculine card! Love the background and your design! The sentiment is way cool--love that! I would think your hubby would have liked his card! Now get back to work and no more farting. Um, I mean, no more farting around.